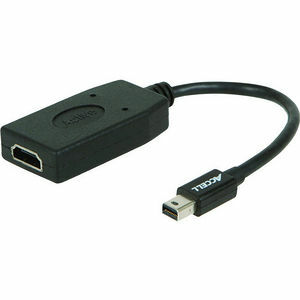 The UltraAV Mini DisplayPort 1.2 to HDMI 1.4 active adapter enables your Mini DisplayPort supported computer to actively connect to an HDMI supported display. Simply connect the Mini DisplayPort end of the connector to your computer and plug your existing HDMI cable from the display into the adapter. The adapter actively converts the Mini DisplayPort video signal into an HDMI signal for a fast plug-and-play setup. Fully compatible with DisplayPort 1.1 and 1.2. The Mini DisplayPort to HDMI adapter works with both DPCP (DisplayPort Content Protection) and HDCP (High-Definition Content Protection) ensuring full compatibility and successful transmission of all audio and video content. The adapter also supports uncompressed 8-channel audio and extended color depths delivering the flexibility to meet most computer application needs. This active adapter supports resolutions of up to 4K Ultra HD (4096 x 2160 @24/30 Hz, 24 bits/pixel), WQXGA (2560 x 1600 @60 Hz, 24 bits/pixel), stereoscopic 3D and requires no external power*. Accell UltraAV Mini DisplayPort 1.2 to HDMI active adapter offers superb performance and reliability. Manufactured to the latest DisplayPort and HDMI specifications, this cable is engineered using advanced cable technology for the highest performance and quality.